Lachen is a small village located in north Sikkim at an altitude of 9,000ft with about 250 village families and few hotels & small shops. Its original inhabitants are known as Lachenpas who are a Sikkimese Buddhist community. They are mostly ship and yak herders. However today with growing tourism demand, many others from different parts of Sikkim have started living here. Although the distance to Lachen from Gangtok is only 121kms, it can easily take 6 to 7 hours to reach the place by car depending on road conditions. Many tourists also come here after having visited Lachung and Yumthang Valley. Lachung to Lachen takes about 2 hours by car. Tourists come to Lachen mainly to visit the famous & picturesque high altitude Gurudongmar Lake which is located further up at an altitude of 17,800ft near Indo-China (Tibet) border. There is no proper tourist accommodation beyond Lachen. So almost all tourists visiting Gurudongmar Lake stay at Lachen overnight before proceeding to the lake next morning. And along with the lake, a typical tour also combines a visit to Chopta Valley, a beautiful valley located in-between Lachen and Gurudongmar which gets covered with flowers in spring and with snow during winter. From Gangtok, you need to take the North Sikim Highway. The road passes through villages like Phodong, Mangan, Tong etc before reaching Chungthang a village which is about 95kms from Gangtok and takes about 5 hours to reach. The road at Chungthang bifurcates. The one towards right goes to Lachung which is about 22kms towards north and onward to Yumthang Valley. The road on the left known as Lachen road goes to Lachen settlement which is about 26kms from Chungthang and takes over an hour. Since both Lachen and Lachung are close to each other, many tourists make a combined visit of Lachen/Gurudongmar lake with Lachung & Yumthang Valley. From Mangan (which is about half way between Gantok and Lachen), you will see river Teesta flowing side by side all the way up to Chungthang. Note that Chungthang is the place where River Teesta actually becomes a river although its source lies far above in glacial lakes such as Tso Lhamo (5,330 meters, highest altitude lake in India and 14th highest in the world). Lachen means 'Big Pass'. This small village at an altitude of 9,000ft is a valley with grassy land and scattered forests of Rhodendrons and conifer. The mountain stream Lachen Chu flows through it in deep gorges and on the other side of the river are large mountains with pine forest and snow peaks. Road condition from Gangtok up to Lachen can be quite rough in patches. Due to landslides, roads are frequently damaged and requires continuous maintenance. While tourists get to Lachen mainly to visit Gurudongmar Lake, there are reasons to spend some time in Lachen itself. Lachen Monastery is one of the oldest in Sikkim and built in 1858. It was then a small hut like structure with only 6 monks. 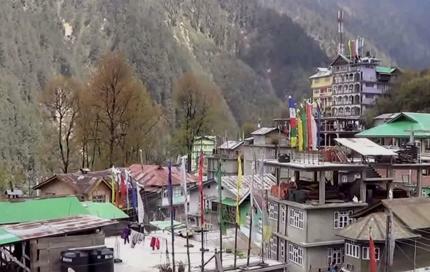 But later in 1977 with financial aid from Sikkim Government, it was reconstructed to its current form. The Monastery follows Nyingma Sect of Tibetan Buddhism. Couple of noteworthy artifacts in the monastery includes a stone in a casket having footprint of Kham Gomchen who stayed at the monastery, another one is a stone looking like a decorative container which has been kept on the altar and preserved by the monks as a religious artifact. There is an open area in front of the monastery offering lovely view of the valley and mountains surrounding it. You should also visit the Handicraft Center of Lachen located in the market area. The original residents the Lachenpas have been weaving carpets, shawls, blankets, bags etc since ages. They are made of yak and ship wool. This is a great place to see many such samples and watch some of the local ladies weaving them. There are wood crafted items as well like Buddha's idols. There is also a Tourist Information Center at Lachen. You can get post cards, maps etc here. This is the largest lake in Sikkim, one of the highest in the world and considered very sacred by both Buddhists and Hindus. You should start from Lachen early in the morning (by 3:30am) because you need to be back by lunch time. The weather near Gurudongmar usually starts becoming bad as the day progresses, so you need to leave the lake area and start for Lachen by around 9am. But the early start is not a problem because the daylight here breaks very early too. The staff at your hotel in Lachen would wake you up at around 2:30-3:00am to get ready. The journey usually starts while it's completely dark. Your first stop is at Thangu, a tiny hamlet with only handful of village huts and a large army base. Thangu is a valley with lush meadows located at an altitude of 13,000ft and about 35kms north of Lachen. It takes over 2hours to reach Thangu from Lachen. Within couple of hours the altitude changes by about 4,000ft. So you can imagine how steep the road is. There are a few stalls here where you can take tea and have hot noodles for your breakfast. You can distinctly see the change in foliage as you get to Thangu. From green forests or large trees, the foliage changes to mostly smaller bushes. If you visit during May/June, you can see the valley full of beautiful alpine flowers. From November onwards, the valley gets covered with snow till March. Not until long ago, almost all villagers from Lachen would move to Thangu during summer and take advantage of the lush green meadows here to herd their cattle. But with growing tourism and change in ways of living, most now stay back at Lachen. 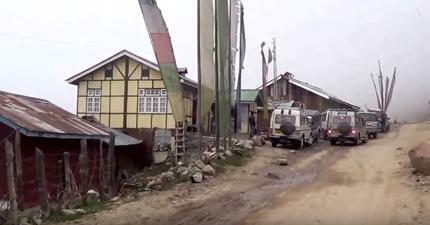 Although there are some basic accommodations at Thangu, tourists require special permission from the Indian Army to stay here due to nearby border area, and you won't get that easily. If the weather is bad further up, the army men posted there would send the vehicles back. And sometimes tourists return from here due to high altitude problems. So getting to Gurudongmar requires some luck. From Thangu the distance to Gurudongmar is about 40kms (i.e. 67kms from Lachen). Although the distance looks short, it will require about 4 hours to reach Gurudongmar from Lachen (so about 2 hours from Thangu). This is because it's a gravel road (made of stones & boulders) and very rough. Only large vehicles like Scorpio, Bolero etc are able to negotiate this road and vehicles move slowly. Thangu is the last civilian settlement along this route. Further along the way you will pass through army check posts. The final check post is the Gaigaon Check Post at an altitude of 15,000ft. This is the highest altitude check post in the world. This is where your papers would be checked for the last time. From Thangu onwards you are on high alpine plateau (known as the Tibetan Plateau), there is hardly any vegetation and you will see rocky mountains all around other than some scarce rhododendron bushes. If you have been to Ladakh, you can see a striking similarity between the two terrains. The road is known as Gurudongmar road and eventually splits. A narrow road on the right goes uphill to the Gurudongmar lake, while the other one continues to Tso Lhamo lake which is about 10kms away. From there the main road continues further north-east to the Indo-China border (another 4kms from Tso Lhamo). Tso Lhamo lake is fed by glaciers and is one of the main sources feeding River Teesta. Gurudongmar lake is located at an altitude of 17,800ft and covers an area of 290 acres making it the largest lake in the whole of Sikkim. It's surrounded by snow clad mountains making it a stunningly picturesque site. During winter, the lake freezes except for one small area. The Buddhists and Hindus believe that this specific area is blessed. In fact the whole lake is considered holy and is believed to be having many healing powers. You will see Buddhist prayer flags fluttering on the sides of the lake. The Gurudongmar lake has been named after Guru Padmasambhava (an 8th-century Indian Buddhist master) who came here on his way back from Tibet. There is a legend associated with him and the lake. Since the lake used to completely freeze during winter and could not be used as a source of drinking water during such time, the locals pleaded to Guru for a solution. Guru agreed and placed his hands on one point of the lake, and it is this point where the water never freezes any longer. Since then the lake is considered holy and devotees collect sacred water in containers. There is a small temple of Guru Padmasambhava next to the lake and you can see hundreds of colorful prayer flags fluttering as a cool breeze flows in from the lake. On your way back from Gurudongmar, stop at Chopta Valley located at 13,200ft near Thangu. It's only 2kms from Thangu towards Gurudongmar. So while returning, Chopta Valley will come first and then Thangu. This is a picture perfect valley. During summer and monsoon (May to September) the valley is carpeted with flowers such as primula, rhododendrons and several different kinds of wild flowers. And during winter however the valley is snow covered. This is where you can walk over frozen river during the winter time. Spend some time here and proceed to Lachen via Thangu. Being a protected area, you need to get Protected Area Permit issued by Tourism and Civil Aviation Department of Sikkim. You should contact a registered tour operator in Gangtok to get this done minimum one day before you start for Lachen. Foreigners are not allowed in Gurudungmar Lake because this is an international border area. Foreign nationals can go only up to Chopta Valley. The permits are checked at several places along the way including Mangan and Tong. Visit How to get Permits in Sikkim for complete information about getting necessary permits for touring various parts of Sikkim including Guridongmar lake. If you are travelling with a child below 5 years, there is high possibility that the child won't be allowed by army personnel beyond a check post shortly after Thangu. This is due to the high altitude problem (mainly lack of oxygen) that the child may suffer from. So taking a child below 5 to Gurudongmar is not recommended. The same such restriction would apply for senior citizens above 65. This is however subject to the discretion of the army personnel posted at the check post. Although you may find several individual drivers in Gangtok who can help arranging the entire tour including vehicle, permits and hotels at a cheaper rate, I strongly recommend that you should visit Lachen/ Gurudongmar lake and Lachung/ Yumthang only through tour operators who are registered with Sikkim Tourism Department. Click here for some of such well known operators. Day1: Reach Lachen from Gangtok, overnight stay at Lachen. Day2: Start early (by 4am), visit Gurudongmar lake & Chopta Valley, return to hotel, have lunch and proceed to Gangtok. Overnight stay at Gangtok. Day2: Start early (by 4am), visit Gurudongmar lake & Chopta Valley, return to hotel, have lunch and proceed to Lachung. Overnight stay at Lachung. Day3: Star early, visit Zero Point, Yumthang Valley, return to hotel, have lunch and proceed to Gangtok. Overnight stay at Gangtok. High or Low season. Usually the high seasons are between April 1 - June 30; September 15 - October 30; December 20 - January 5, and the rates are quite higher in high season. Category of vehicle. A luxury package would usually include a vehicle like Innova, Scorpio or Xylo; while a budget package would include a Sumo, Bolero or Mahindra Max. Category of Hotel - luxury hotel, mid-priced hotel or a budget lodging. Your group size. A large vehicle can accommodate up to 7-8 persons. So more the number of persons, the per-person cost comes down. Tour operator. Rates of high-end tour operators with established brand names would charge higher package rates, but they would be more reliable than the unknown ones. To give you an idea... a 3-day/2-nights tour package from Gangtok to Lachen (including Gurudongmar Lake) and Lachung (including Yumthang) would cost around Rs. 25,000 for two persons in high season for a mid-priced package that includes mid-range hotels on AP plan (i.e. breakfast & dinner), local sightseeing on the way and a reserved vehicle like Sumo, Bolero or Max. The same package would cost around Rs. 20,000 in low season. The cost includes the permit fees. Lachen has plenty of Hotels. Once you select a hotel, you can ask your tour operator to book that and include it in their package. But remember, you are likely to stay at Lachen only for one night, and leave by early morning for Gurudongmar, return to the hotel for lunch and head back to Gangtok or your next destination. So you are staying here basically to spend the night. The best hotel by far is Apple Orchard Resort which is a 3star category hotel. Rooms are nice with wooden floor paneling to keep them warm. They also provide room heaters and hot water bags. There is in-room coffee/tea maker, phone, geyser in bathrooms etc. You get nice view of mountains and waterfall at the front side. They have a dining lounge serving meals. Another one is Hotel Hill Retreat which is a budget hotel. They have recently renovated the rooms. Rooms have tea/coffee maker, TV, 24hrs hot water in the bathroom, room service, generator backup for lights etc. So if there is power cut (which is quite common in Lachen), there won't be any hot water. They have standard and deluxe rooms both for double and triple occupancy. Meals are included in rates. The hotel is located on Lachen Road, Near Old Lachen School. They have another budget hotel in Lachen called Snow Retreat. But the Hill Retreat is generally preferred by tourists. April to May is a great time to go as the rhododendrons are in full bloom during this time. Beginning of December is also a great time to see snow covered Chopta Valley, walk over frozen river, and if roads are open then onwards to Gurudongmar to see the frozen lake circled with snow mountains. Carry enough warm woolens in all seasons as it can be biting cold at the higher reaches. Carry all your medication particularly for any high altitude sickness. If you have heart or breathing problems, avoid visiting Chopta Valley or Gurudongmar. There are no ATMs here, so carry enough cash. Hi Raj. First, i would like to thank you for this wonderful website. Coming back to my query, we are planning to visit Lachen in June and wanted to know if we can club Cholamu lake also with Gurudongmar lake. Does it require a separate permit? Hi, it's difficult to get the special permit for Cholamu (Tso Lhamo) lake these days. It requires a Protected Area Permit (PAP) with permission from the army which is hardly issued to civilians. Also the stretch of the road between Gurudongmar Lake up to Tso Lhamo is very bad... most tour operators won't be ready to use their vehicles on that road. Hi Raj, may i know whether foreigner (im a Malaysian) is allowed to go to Gurudongmar Lake? There are 4 of us in a group. Looking forward to receiving your reply. Thank you. Hi, foreign nationals are not allowed to visit Gurudongmar lake. You can go up to Lachen and then till Chopta Valley, beyond that you will be stopped at the check post. Hi Raj, me and my family are planning to visit Gurudongmar Lake on the last week of November from Kolkata. Please guide me about the weather condition at that time. It will be biting cold up there at the lake during last week of November... take adequate precautions for cold and do not stay there for more than 20-30 minutes. October is usually a great time to visit Gurudongmar lake. Temperature during the day time would be close to zero degree Celsius. You should not stay there for more than 30-40 minutes... oxygen level there is quite low. I am a nepali citizen and I want to visit Gurudongmar lake is it possible to get the permit for Nepali citizen. I have got all the documents passport citizenship voter id card driving license. Unfortunately no foreigner is allowed at Gurudongmar lake. 1. Can I plan to stay at Mangan and then make trips to Lachen and Lachung? Hi, there are few hotels & homestays in Mangan where you can plan to stay if you want and cover Lachen & Lachung. Most accommodations there are basic. Suggest you work through a registered tour operator in Sikkim to get your permits in advance. Sir, Let me thank you at the outset for the wonderful and useful information you are providing. I am 72 year old and want to tour Darjeeling and Sikkim from 15th April. I want to travel to north Sikkim. Is it advisable for me to travel to Gurudongmar lake? If you are physically fit and have no breathing or heart related problems, then you can visit Gurudongmar.